Print was good, finish was rubbish! So there I was wandering around Wilkinsons (a hardware/homeware store for those outside the UK) when I came across some strimmer wire. 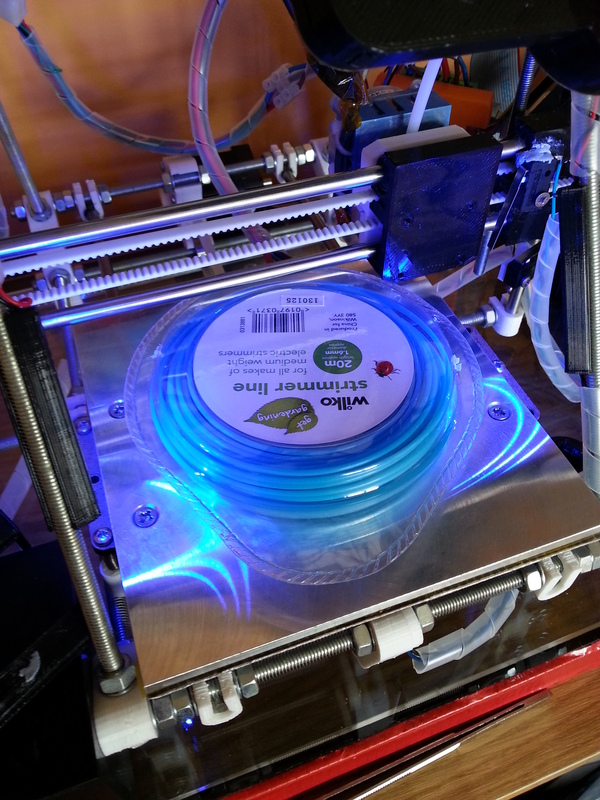 “Hmmm,” my mind went, “that looks awfully like filament for my Huxley, ooo look, 1.6mm so close the the 1.75mm I use”. So I brought some. £2 for 20 meters, not cheap, but some fun for the weekend! Getting home I have a quick look online to see if I can find out which plastic it actually is, it doesn’t say on the pack. As far as I can figure out it should be nylon. Another search points me to the RepRap site as I look for the best way to use it (http://reprap.org/wiki/Taulman3D_618_Nylon). First issue, it doesn’t bond to glass or aluminium. However the Wiki suggests glue sticks which I don’t have around the house. I do have some PVA woood glue though, should be good enough. A light coat over the glass bed and then off we go! Issue two quickly shows its head, moisture. Darn its spitting like a Cobra. Still my test piece comes out looking reasonably okay and it was stuck to the bed like you wouldn’t believe. Some warm water dissolve the glue and off came the part. To solve the moisture problem I have to dry out the filament. Now I could do this in an oven at about 50C or so for a few hours, but the filament came in a nice little package. So I made a couple of holes in the top of the packet, place it on the bed of my printer and set the bed to 50C. Again this is an experiment and will be interesting to see if this will help dry out the filament. I’ll leave it on my printer for a few hours and see how it goes.